I sang this song when I was a Brownie, a bazillion years ago. I can still see myself sitting in a circle in a classroom in my elementary school. I must have been eight or nine years old. I lost many – okay all – of my old friends when I left the Church. I had been a best friend with Rev. Moon’s daughter and with a few Korean children who were born into and raised in the Church. When I, as my brother says, simply disappeared from Church life, I disappeared from them as well. One of the hardest parts of leaving the Church was losing what felt like everyone and everything that had been important to me. Everyone and everything that I had loved. I wondered where my old friends were. I wondered how my old friends were. I wondered if I’d ever see them again. And I wondered if I’d be flush with shame if I ever did see them – shame at leaving and sinning and walking away. Shame at abandoning the Messiah and letting God down. Shame and disgrace and self-loathing. Do you get the sense that leaving the Church filled me with at least a few not-so-good emotions? Yet despite these fears, I still longed to reconnect. I’ve been on my journey to revisit and remember, and finding my friends felt like it would help all the shattered pieces of my past fall even more into place. I did. It did. It was amazing. I’d found Rev. Moon’s daughter a number of years ago – my memoir culminates with us reconnecting and with my attending a service at which she delivered a sermon – but I again hadn’t spoken with her in years. I reached out to her a few weeks ago and ended up having dinner with her and her family. There are no words for how amazing it was. There are no words for how whole-ing it feels to reminisce with someone who was there, who gets it, who gets me. To not have to explain myself, or the Church or the beliefs, and to agree that things were crazy and that it was hard. So hard. Rev. Moon’s daughter then reconnected me with one of my friends whom I hadn’t seen since I was about sixteen. Whom I used to see every week. And that friend reconnected me with another friend whom I thought I would never see again. There are no words for how wonderful it was. How wonderful it is. I had lunch with one friend, and we laughed and cried and held each other. We swore we wouldn’t lose each other again. We tried to make sense of all that had happened to and around us, all that we’d been taught, all that we’d believed. My friend whom I thought I’d never see again – well I haven’t actually seen her yet, but I’ve seen a photo and we’ve talked much of it through via text. And we swore we’d never be torn apart again. My heart is filled with such love at finding my old friends. My mind is bending over in on itself, and also watching all the missing pieces snap into place. 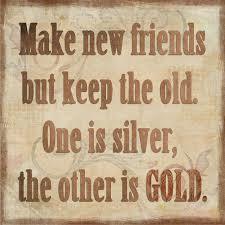 Make new friends but keep the old. I’ve finally been allowed to keep my old friends. I am so happy for you, Lisa. You are a special person, good to the core, from when you were a little girl, years before you ever knew about the Church. I’m so glad you are able to once again experience the love of and from people who you thought you lost, but also know the quality of who you are.